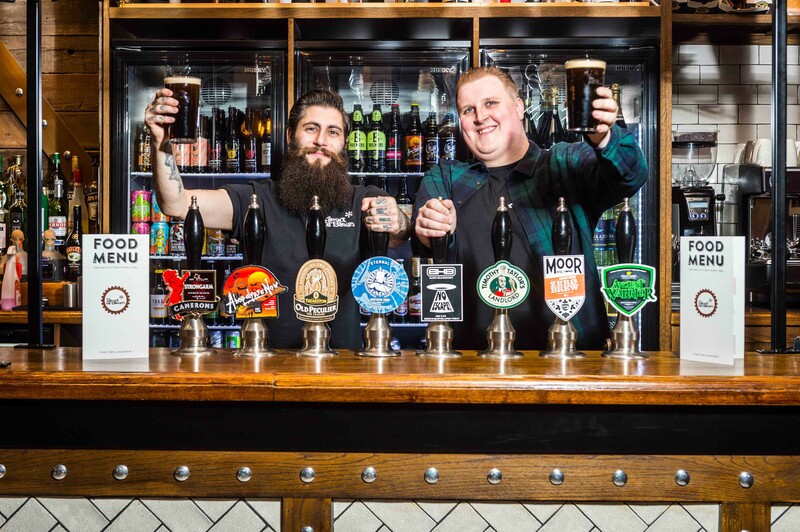 On 29th October, our reporter Beth Girdler- Maslen had the pleasure of attending the launch of Head of Steam, a new bar and restaurant, specialising in craft beers. Upon entering the venue, I was astounded by how big the inside was, with a large and full bar taking centre stage on the ground floor. 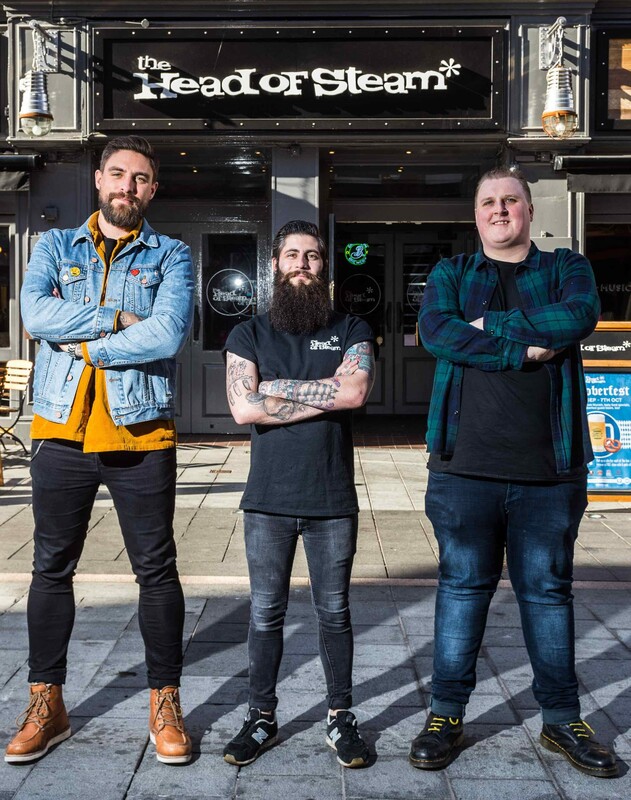 Stocked to the brim with over 40 different gins, with countless craft beers and a promise to rotate when more craft beer comes through, Head of Steam has more than enough to offer. To prove this even more, a television screen propped up on the wall showcased the extensive range of beers currently on offer – 13 slides worth! The décor is railway themed, with comfortable leather booths, overhead luggage racks and mechanical cogs. The exposed brick works well with the colourful beer placards and trays adorning the walls. It’s a fun place to look at, with so many things on display without being too overpowering. I especially loved the beer bottle chandelier! For drinks, as I’m not a big fan of craft beer, I tried some of their 40 flavours of gin – not all 40 unfortunately. The bramble and ginger gin was fragrant, sweet and beautiful to look at and the violet gin was a light and refreshing after meal finisher. As I couldn’t attend a craft beer bar without having tried the goods, my plus one sampled some for me. The South Island Maori pale ale was deliciously smooth, with a nice hoppy finish and Speakeasy IPA had a citrusy and tangy taste. Both beers were made by the Vale of Glamorgan (VOG) Brewery and were a perfect representation of great Welsh breweries. The menu was full of dishes that I wanted to try. Full of breakfast, lunch, mains, tapas and desserts, there is something for everyone. Although the menu was jam-packed with options, it also felt very simple. I tried the lamb, chorizo and chickpea pie, which was delicious. The pastry was perfectly crispy with a delicious tomato filling. The lamb was tender and the chorizo had just the right amount of spice. The small crispy onions on top gave the pie a lovely finish and the mash was perfectly creamy. The Full Head of Steam Burger, with bacon, cheese and a beer beef burger had an exceptional chilli jam which made the whole meal, putting it a step ahead of a good restaurant standard burger. The food definitely sets it apart from normal pub food, making it more sophisticated. The whole atmosphere of the place had an industrial but homely feel, especially with the Head of Steam being dog-friendly. I very happily sat with a gorgeous dog called Molly for most of the evening, giving her cuddles. Having dogs in a pub or restaurant really makes the place feel like home and Head of Steam definitely has that cosy atmosphere. It is an establishment which offers everything and they haven’t fallen short on any aspect. My only criticism is that I couldn’t take Molly with me.